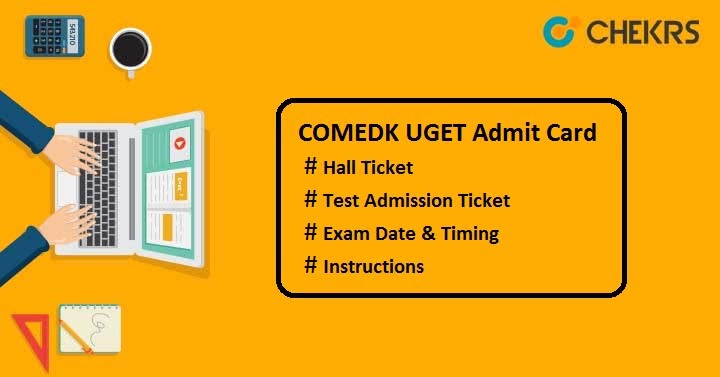 COMEDK UGET Admit Card 2019: Consortium of Medical, Engineering, and Dental, Karnataka (COMEDK) UGET is an undergraduate entrance test conducted for admission to engineering courses. To appear in this exam, candidates will have to carry COMEDK UGET Hall Ticket to the exam center. Some candidates know Admit Card as a Test Admission Ticket (TAT). The admit card is very important document to be brought to the examination center as it contain information like exam venue & its address, exam day, date & timing, candidate’s name, roll no, application/ registration no etc. Here we have shared complete information about COMEDK 2019 Admit Card, important dates, instruction etc. Candidates who want to give COMEDK UGET-2019 can check the tentative schedule of this exam here. Once the dates are announced by the authority, then we will provide you the official dates. Go to the official website of COMEDK. Search for the “COMEDK UGET 2019 Hall Ticket” download link & Click on it. Download or Save it. Take 2 or more copies of printout of it for future use. The hard copy of COMEDK UGET 2019 Admit Card will not be dispatched either by email/post /courier / in person to the candidates under any circumstances. So must download it after the link activation. No person will be permitted to enter the exam center or examination hall. So do not forget to bring your admit card along with the any one of Identity proof. Do not take tampered or distorted hall tickets during the examination. In fact it must be preserve till the end of admission procedure. Take 2 recent passport size photographs also; it should be same as uploaded while filling the COMEDK application form. The applicants must sign on their Online TAT in front of the supervisor/ invigilator. Candidates must reach the examination center 1 hour before the commencement of examination. Hope this content will be helpful for all the viewers. For further query, drop your question in the comment section below.